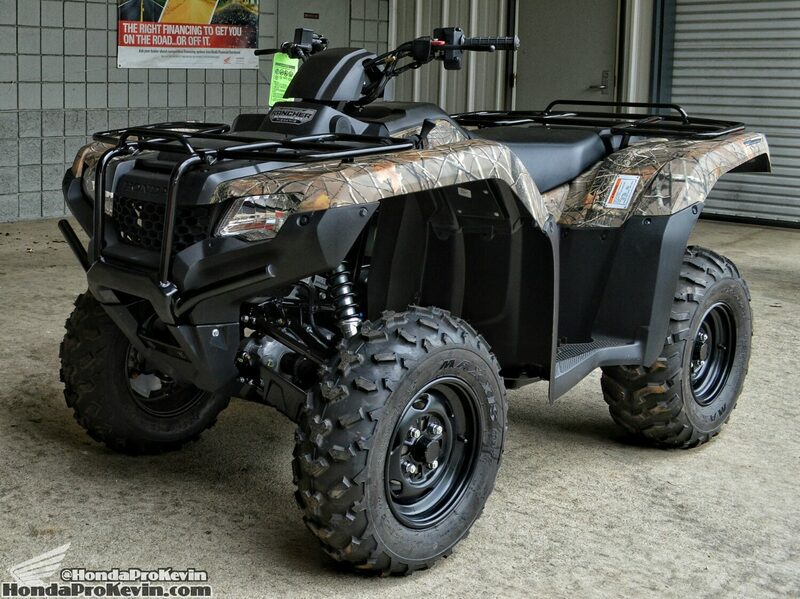 What is the 2016 Honda Rancher with the model ID TRX420FA5G / TRX420FA6G? If you’re asking yourself this, trust me you are not the first and definitely not the last. Honda has so many different model variations of the Rancher for 2016 it can be rather confusing. This post is going to be an overview of this specific model. The other Rancher models with Manual Shift, ES (Electric Shift), Straight Axle, EPS (Electric Power Steering), DCT with Straight Axle instead of IRS etc will be covered in other posts as well as the other options available should you want a 2×4 instead of a 4×4 like the models mentioned above. Due to all the differences in models I want to break down each one individually so there’s no confusion. 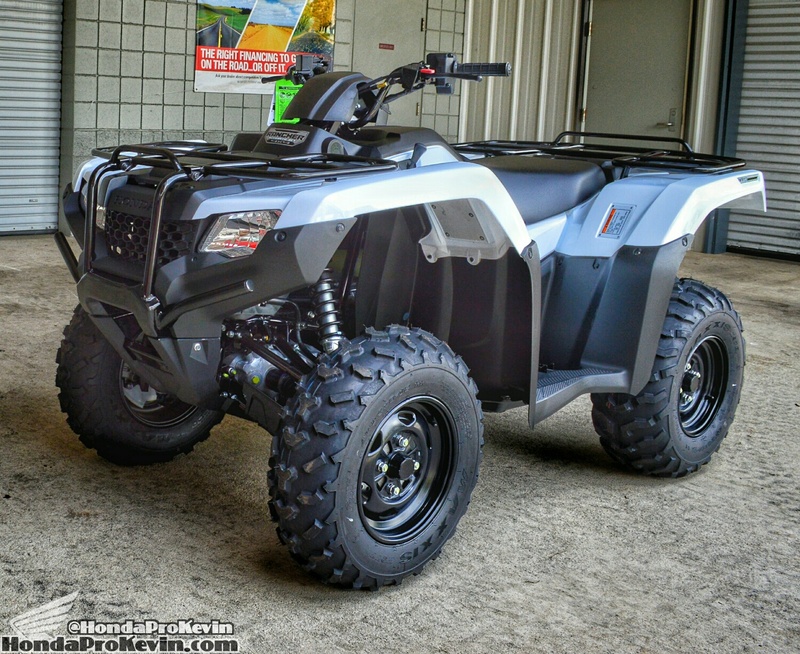 Honda’s water-cooled fuel-injected 420cc Rancher ATV model lineup over the years have built quite the impressive number of loyal followers and with good reason. When you think of the word “reliable” or “durable” what manufacturer comes to mind first? I’d almost bet money you thought of Honda but I’m not a betting man so we’ll skip the answer on that haha. When you pair up that legendary reputation Honda has built over more than half a century with more options than any other mid class on the market, it’s easy to see why the Rancher model lineup is our best-selling ATV bar-none. In 2014 Honda did a complete overhaul & redesign on the FourTrax Rancher models with a straight axle rear suspension. The Rancher 420 IRS model had a few more changes being designed and needed the extra R&D. That is why the 2014 TRX420FA was still the body style and frame etc as the 2013 and earlier Rancher. Looking at the 2014 TRX420FA Rancher IRS model in comparison with a 2014 Rancher straight axle model you’ll see what I’m referring to. The new IRS Ranchers incorporate a host of upgrades, starting with an all-new double-cradle steel frame developed with Computer Aided Engineering and new independent dual-arm rear suspension (IRS) design with suspension travel increased front and rear. This new frame features increased stiffness for even more precise handling, while more effectively transferring energy for a smoother ride. In addition, that new chassis can be easily identified because it’s wrapped in all-new bodywork matching the newer style on the straight axle Rancher that it received in 2014. What does IRS offer you when compared to a sold straight axle? Not only increased travel and ground clearance but also a smoother and more supple ride while going through the trails. How much extra does the IRS DCT Rancher cost versus the straight axle DCT Rancher for 2016? The IRS comes with a slight price bump, MSRP goes from $6,699 to $7,199. More details on price comparisons between the different Rancher models for 2016 are at the bottom of the page. That’s only the start though as the Rancher 420 IRS model was just worked over by the finest engineers in the world. All of Honda’s utility model ATVs like this Rancher were designed, tested, built, etc right here in the good ole US of A! 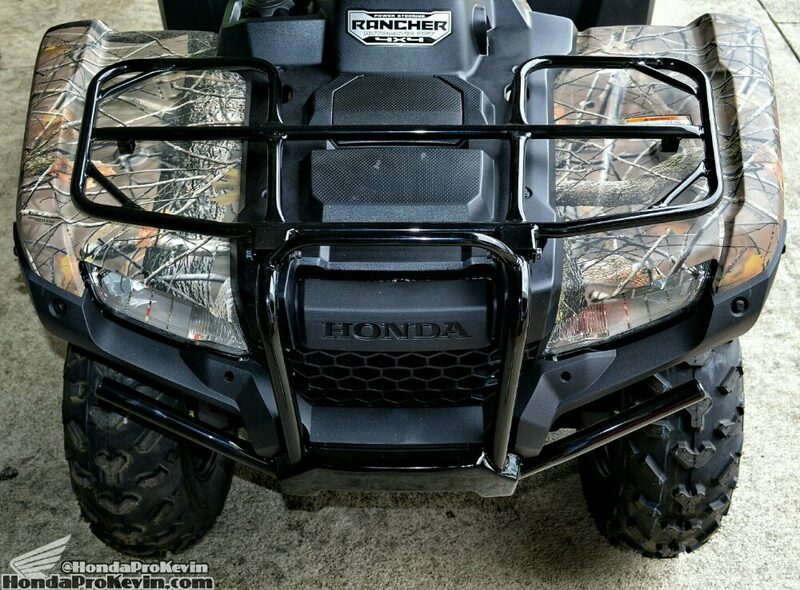 Between the Honda geniuses in South Carolina and Ohio – they hit the nail on the head with the new Rancher. We have some other more visible changes from last year that carry on to the 2016 FourTrax Rancher 420 DCT / IRS include an all-new one-piece tank / side cover that allows easy access for maintenance – no tools are required for removal. This newly styled bodywork also provides better protection from the mud when you are in the mood to go hit the mud pits. If playing in the mud isn’t your thing then you’ll benefit from the added protection from the elements while working with your Rancher or just simple trail riding. A first in the world of ATVs, Honda’s premium Automatic Dual Clutch Transmission (DCT) in the Rancher 4×4 Automatic DCT model makes it a standout. 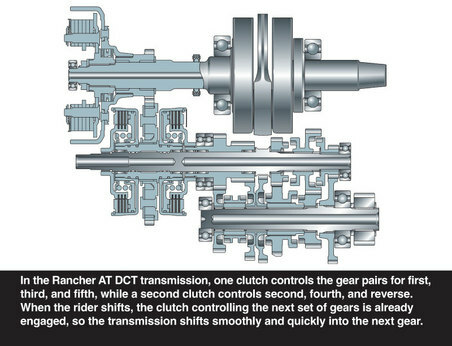 As mentioned in the main body of the Rancher story, for 2014 the Rancher 4×4 Automatic DCT now employs a new-generation DCT with an elevated level of sophistication: new updated dual-zone shift logic offers improved adaptation to all riding conditions based on rider and vehicle inputs, effectively and intuitively adjusting shift points whether riding under normal or aggressive conditions. Thanks to this change, the DCT significantly reduces gear “hunting” – that is, shifting back and forth repeatedly between two gears – as it performs the most appropriate shift actions automatically. As a result, the net benefits to the rider are manyfold: better automatic transmission feel as the Rancher reacts more intuitively to the rider’s operational style and intentions; enhanced power feel; increased response; reduced engine lugging; plus less fatigue and more rider comfort. The Automatic DCT provides the compact size and strength of a manual transmission (no belts to slip, break or burn out) with the convenience of an automatic transmission, while giving you the option of push-button manual control via Honda’s Electric Shift Program (ESP). At times this is also just referred to as Electric Shift (ES). This new Automatic Dual-Clutch Transmission is lightyears ahead of the conventional automatic transmission Honda used on the 2014 and prior Rancher AT models. This new setup is something you truly have to hop on and ride to appreciate. 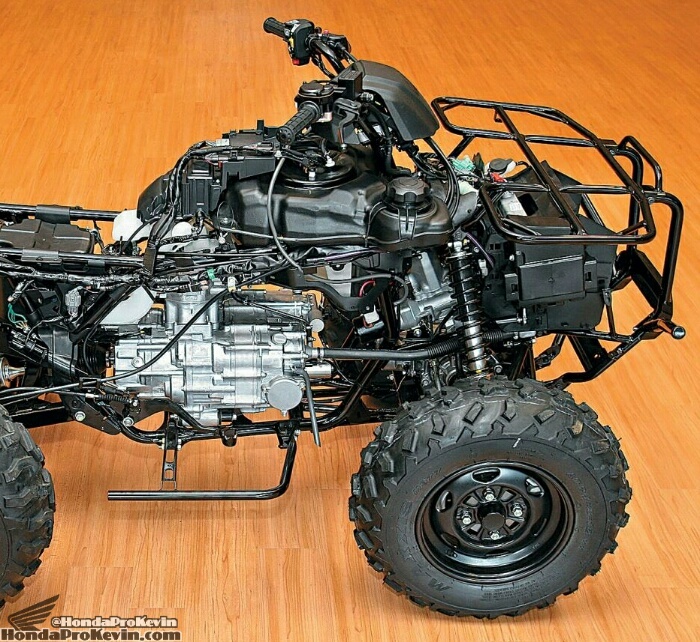 It’s amazing the technology Honda has crammed into the transmission of an ATV. Just a few years earlier, the only thing with a DCT transmission were high-end sport cars and super cars. The key to the DCT design is the innovative dual-clutch configuration coupled with a two-piece mainshaft. The first mainshaft has first, third and fifth gears all driven by the first clutch. The second mainshaft is sleeved over the first shaft. It carries second, fourth and reverse gears, and it’s driven by the second clutch. This designs allows two gears to be engaged at the same time, and each gear is pre-shifted before power is applied. Shifting is then accomplished by disengaging once clutch and engaging the other. With the DCT Automatic transmission you have the option of using the ESP mode (Electric Shift Position) also known as ES in years past (Electric Shift). With ESP, an onboard Electronic Control Module (ECM) monitors information from four sensors – engine rpm, countershaft speed, shift drum angle and shift spindle angle – to control the speed of the electric-shift motor’s gear and clutch engagement. 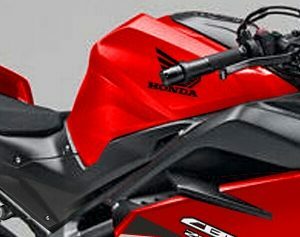 Gear-engagement speed varies according to rider usage: The transmission shifts more quickly when the riding style turns sporty. A Neutral lockout at speeds greater than two mph ensures available engine braking when descending hills. For smooth shifting, the transmission cannot be shifted from Neutral to First gear or Reverse at engine speeds above 3000 rpm. ESP is not dependent on battery power; it operates whenever the engine is running. Should the rider ever need to shift manually, DCT model Ranchers are also equipped with an auxiliary shift lever in the toolkit. Honda builds a “backup” into everything. Just in case you do have a problem on the trails, your DCT Rancher will not leave you stranded and having to walk back out of the trails. On the subject of emergency situations, the Rancher also has an optional auxiliary backup pull-start should your battery die. The Rancher 4×4 models also feature TraxLok selectable 2WD/4WD capabilities that enable the rider to quickly shift between the nimble handling of a 2WD and the extra traction of a 4WD ATV. TraxLok incorporates a two-way mechanical roller clutch with a series of hardened-steel rollers that lock up in a mere six degrees of rotation for a smooth, virtually instantaneous response while either accelerating or decelerating on flat ground or an incline. This system also operates in Reverse. To ensure smooth operation, the TraxLok system only engages when the speed differential between the front and rear wheels is less than six mph. Once engaged, the system remains engaged on downhills for true 4WD braking. In addition, when TraxLok 4WD mode is engaged, a torque-sensitive limited-slip front differential reduces steering effort for a lighter feel. This torque-sensitive limited-slip front differential automatically sends power to whichever front wheel has the most grip. This system also allows both wheels to maintain essentially the same speed and drive regardless of traction conditions. It also virtually eliminates torque steer and drastically reduces the effort necessary to initiate a turn, thus shortening the turning radius and improving handling. The new Rancher IRS models also receive new tougher, plastic CV joint boots supply added durability thanks to their more puncture – and tear-resistant qualities. All-new double-cradle steel frame developed with Computer Aided Engineering features increased stiffness (up 20 percent) for even more precise handling and a smoother ride. 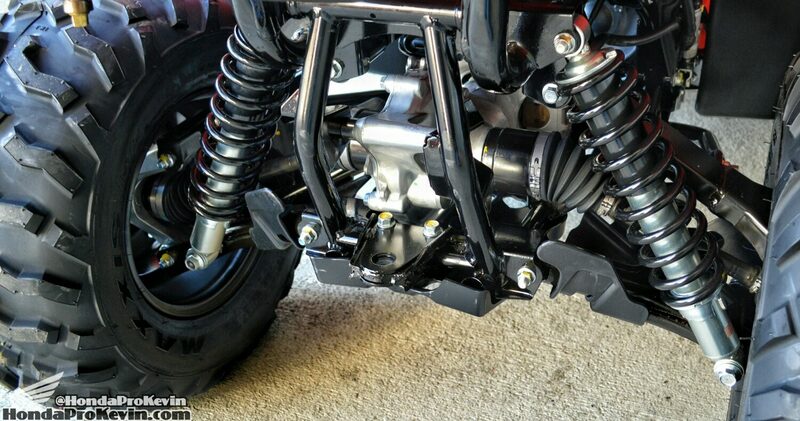 New independent double-wishbone front suspension gains an additional 1.0 inch of travel. 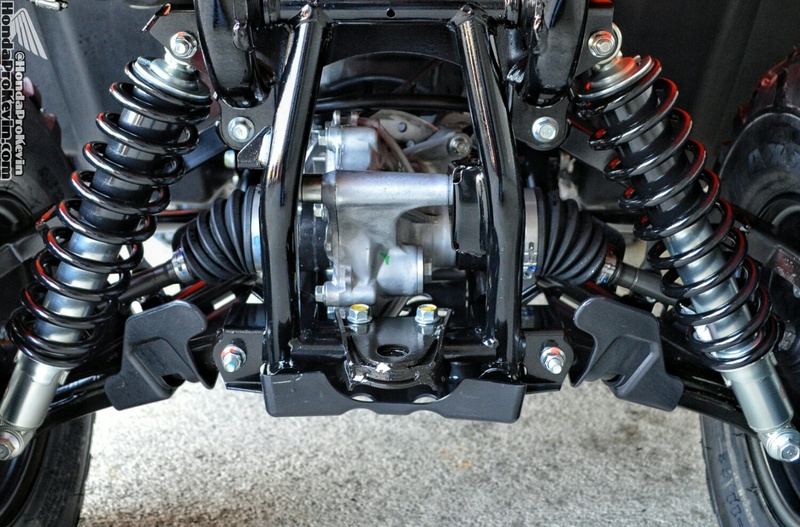 New independent dual-arm rear suspension design offers a more optimal shock ratio and increased suspension stroke for a gain of 2.2 inches of travel. New dual-purpose lever makes it easier than ever to engage Reverse gear as well as setting the parking brake. Simply pull the lever to engage Reverse; push the lever to set the parking brake. 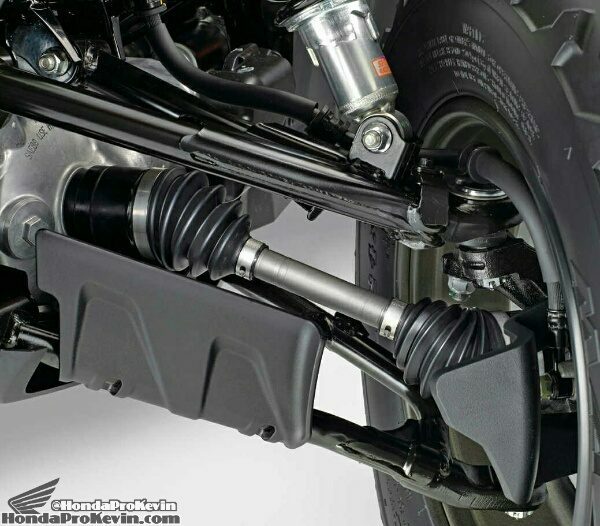 Honda TraxLok 2WD/4WD system offers two drive modes: 2WD and 4WD with TraxLok torque-sensing front differential. Optional Electric Power Steering (EPS) system is a next-generation setup that incorporates new ECU mapping for improved linearity in steering response, reduced low-speed steering effort for enhanced maneuverability and decreased kickback traits for improved all-around steering action. Heavy-duty trailer hitch with 848-pound towing capacity. Twin-headlight system has been redesigned and now features 35-watt headlights with a more focused light distribution pattern for improved visibility after dark. Assembled in Timmonsville, South Carolina, using domestically and globally sourced parts. Super-heavy-duty automatic clutch with a low-rpm engagement point for excellent driveability and towing capability. 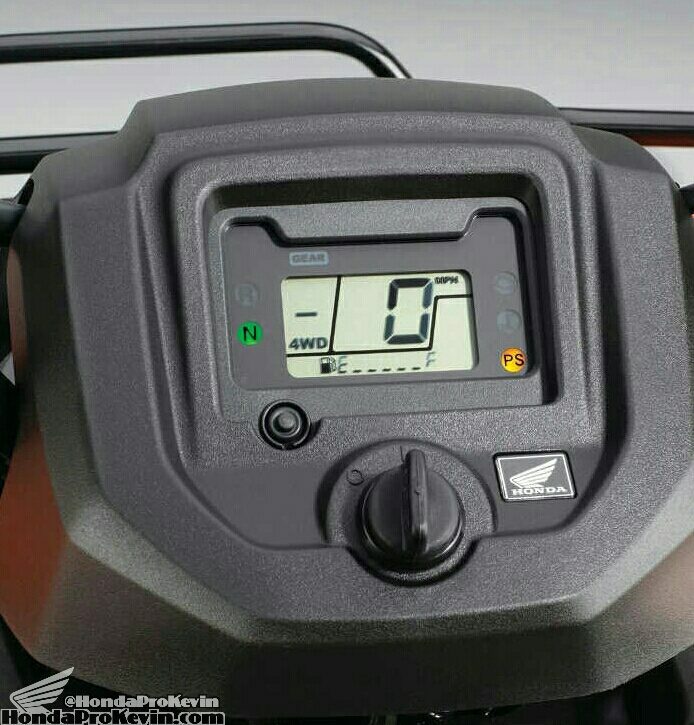 In addition to the fully automatic transmission mode, riders can also employ Honda’s exclusive Electric Shift Program (ESP) for easy shifts with the touch of handlebar-mounted buttons. New mapping for the Programmed Fuel Injection (PGM-FI) system improves power delivery and throttle response, and increases fuel efficiency for greater range. Handy TraxLok 2WD/4WD selector lever, mounted on the left-front panel, allows 4WD when needed for the tough stuff and 2WD when conditions permit. Adjustable spring preload now featured on all shocks to allow suspension tuning to match varying loads and riding conditions. All-new one-piece tank/side cover allows easy access (no tools required) for maintenance. New, aggressively styled bodywork also provides better mud protection. New rear fender and IRS decals separate this Rancher from the rest of the lineup. Increased AC generator output of 450 watts to power more electrical accessories. New high-performance, maintenance-free Yuasa GYZ16H battery for added dependability. Honda Phantom Camo blends into a wide range of field environments, and the application procedures provide better graphic durability and improved resistance to fuel spillage. New digital meter display with added functions like a Maintenance Minder system that notifies when it is time for service. New fuel pump is derived from Honda automobile technology. It mounts in the fuel tank for better heat isolation and offers increased filter life. Larger 3.9 gallon fuel tank (including 1.3 gallon reserve) so you can ride farther between fill ups. New plastic CV joint boots are more durable and tear-resistant. New sealed steering knuckle bearings for extended durability. Newly optimized rider triangle ergonomics for added comfort. A 20mm (0.8 inch) increase in seat foam thickness and softer seat foam increase rider comfort. Larger 190mm dual hydraulic disc brakes up front and 170mm hydraulic disc brake in back for strong stopping power. Full-length synthetic lower skidplate with integrated front brush guard. Front carrier capacity is 66 pounds and larger rear carrier is 133 pounds. Newer mapping for the Programmed Fuel Injection (PGM-FI) system combined with new oxygen sensor feedback technology improves power delivery and throttle response, while also improving emissions and fuel efficiency for greater range and reduced tailpipe emissions. 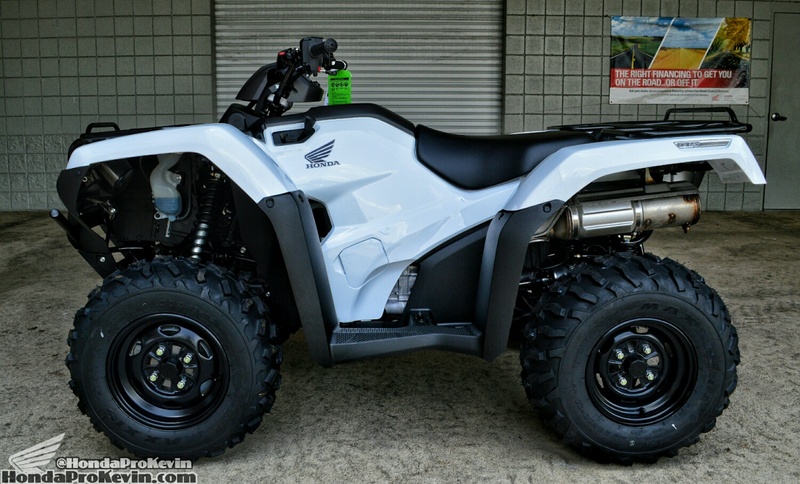 How do Honda’s ATV models benefit from the technology in the Honda automobile line? It would take a 100 page novel to touch base on just a few of the key components but I’ll save that for another write-up. The Rancher 420 has a new fuel pump that is using technology trickled down by their cars. The pump mounts in the fuel tank for better isolation from the heat of the engine and other working components. What happens when you reduce the heat? 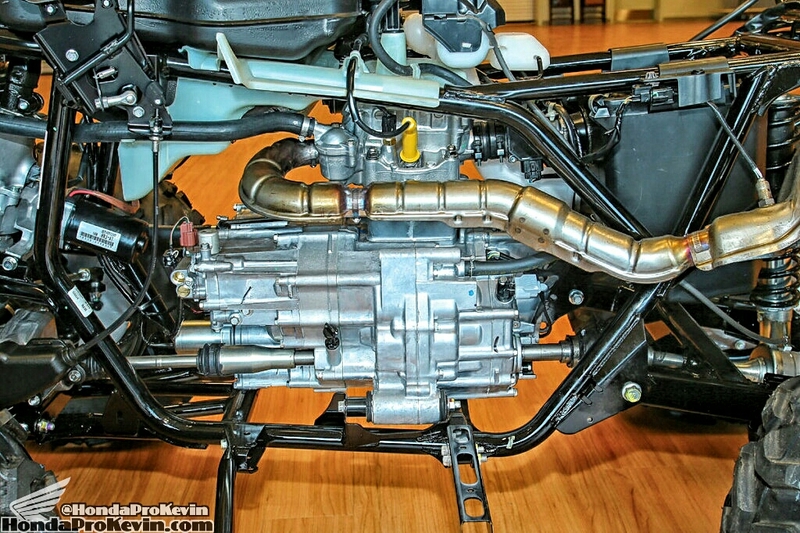 It prolongs the life, in return saves you money $$ in maintaining the ATV throughout the years. The 2016 Rancher 420 gauge display has more features than any other previous generation in the Rancher models history. What do you have on your 2016 Rancher display? Anything and everything you would want and or need to view including: electronic fuel gauge, clock, coolant temperature gauge and a “maintenance minder” system that tracks both hours of run time plus miles driven. Also, the twin-headlight system has been redesigned and now features 35-watt headlights with a more focused light distribution pattern for improved visibility after dark. And a newly optimized rider triangle promotes added comfort, while a 0.8 inch-increase in seat foam thickness and softer seat foam density add further to rider comfort. The 2016 Rancher Automatic DCT model with IRS and EPS has the model ID: TRX420FA6G. Honda debuted EPS back in 2007 on the Foreman 500 (TRX500FPE) and was only available on the ES model as a trial run per say. In 2008 and on, Honda has decided to throw it on every model in their ATV lineup (except Rincon). It was been a huge hit and with good reason. Once you ride a Rancher with the latest generation of the EPS module there is no going back! 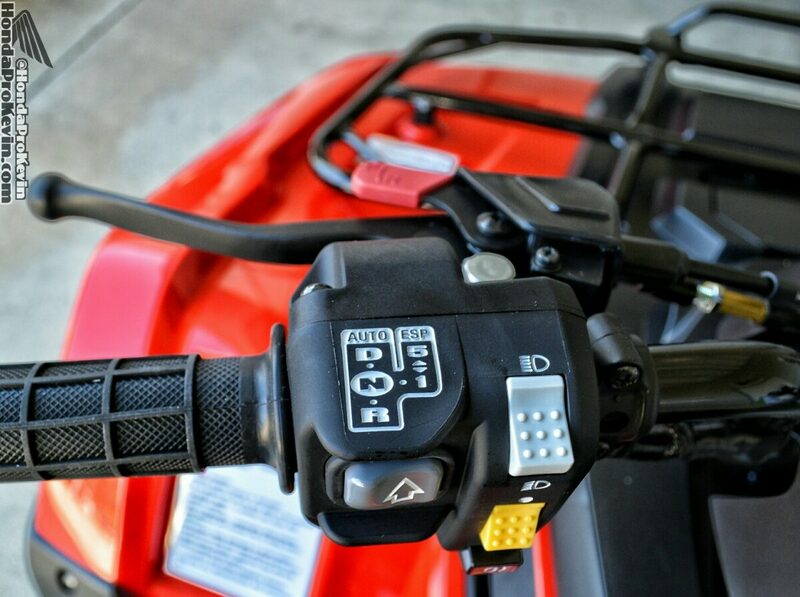 Aboard the Ranchers that incorporate Honda’s Electric Power Steering, a new attachment layout using a three-point mount for the EPS mechanism makes the entire unit more rigid in its placement, and that makes for even more precise steering. This EPS system is a next-generation setup for redone in 2014 that incorporates new settings for improved linearity in steering response, reduced low-speed steering effort for enhanced maneuverability and decreased kickback traits for improved all-around steering action. Have you had a chance to check out the All New Phantom Camo finish from Honda? If not, you need to! Honda went back to the drawing board in 2014 and surprised us all when they brought this to the table. They haven’t changed their camo color scheme or application of the camo for quite some time but it was definitely welcomed as some have had problems with their camo finish peeling on their ATV. 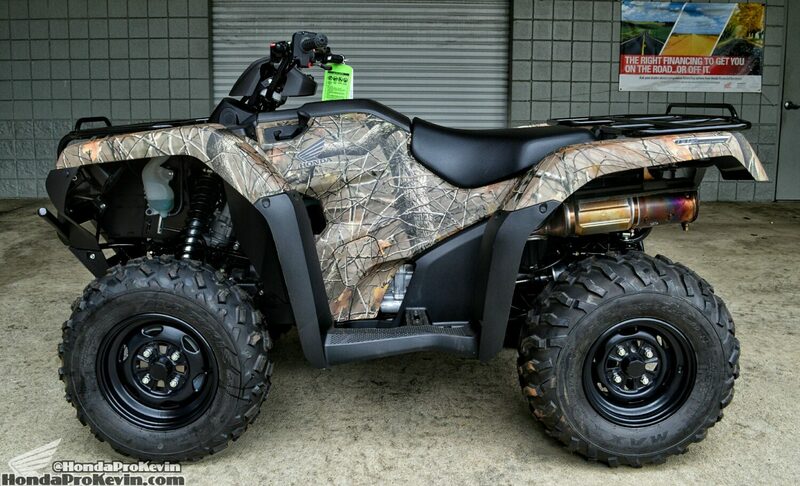 The Honda Phantom Camo colors not only provides excellent camouflage properties that help the ATV blend into a wide range of field environments, but new Honda application processes also provide better graphic adhesion, excellent durability and improved resistance to fuel spillage to keep things looking better, longer. 2016 Rancher 420 DCT / IRS (TRX420FA5G) MSRP Price & Colors: White, Red and Phantom Camo are available. MSRP comes in at $7,199. 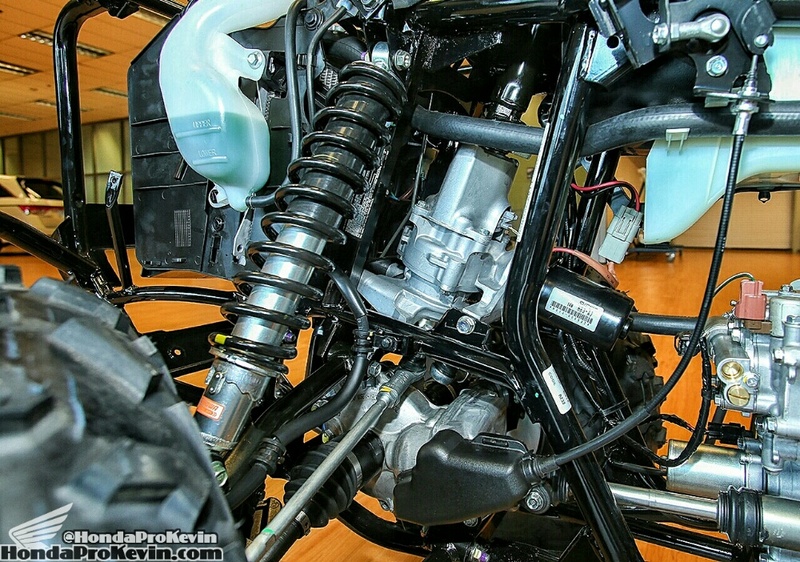 Considering going with EPS (Electric Power Steering) on your 2016 Rancher with IRS? Below are the color options and pricing available if you decide to go with the “Cadillac” of Ranchers. 2016 Rancher 420 DCT / IRS / EPS (TRX420FA6G) MSRP Price & Colors: White, Red and Phantom Camo are available. MSRP comes in at $7,899. 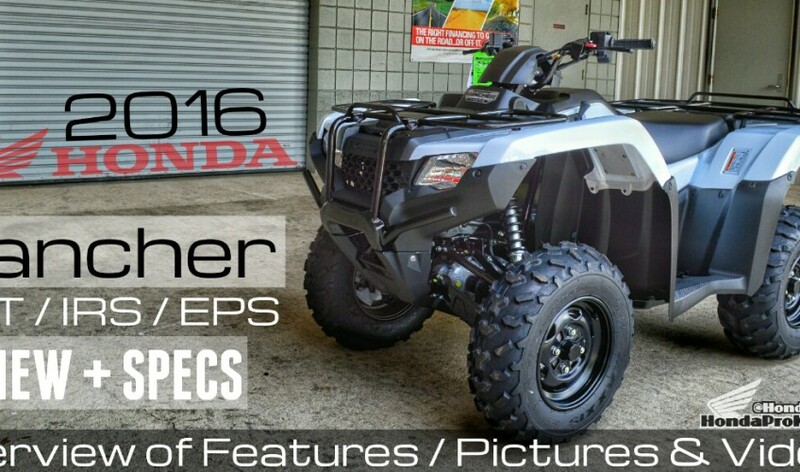 Is your budget for a new 2016 Honda Rancher ATV a little lower than the prices mentioned above? No worries. Honda makes more different models in the Rancher lineup than any other ATV whether it be the 2016 Recon 250, Foreman 500, Rubicon 500 and Rincon 680. If you still want a 4×4 Rancher but don’t want to get into the price-range of the (2) models reviewed, other four wheel drive Ranchers for 2016 have MSRP prices that Starr at $6,199. The Rancher 420 is also available in 2×4 / two wheel drive form with MSRP prices starting at $5,199. I’ll be covering more on those other models at a later time as Honda has more model options than ever for 2016 in their four wheeler model lineup and it can be confusing for some. 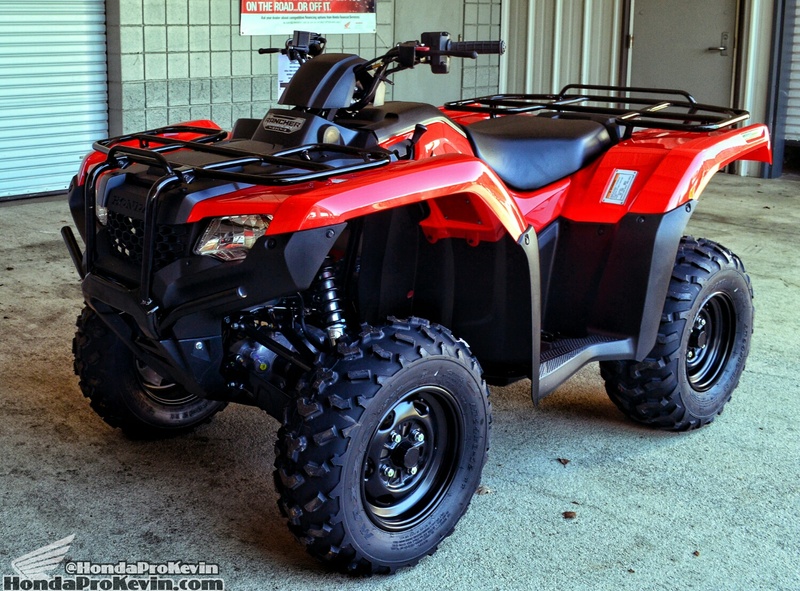 What do you think about the 2016 Honda FourTrax Rancher 420 IRS? Anything Honda dropped the ball on that they should have upgraded or included? 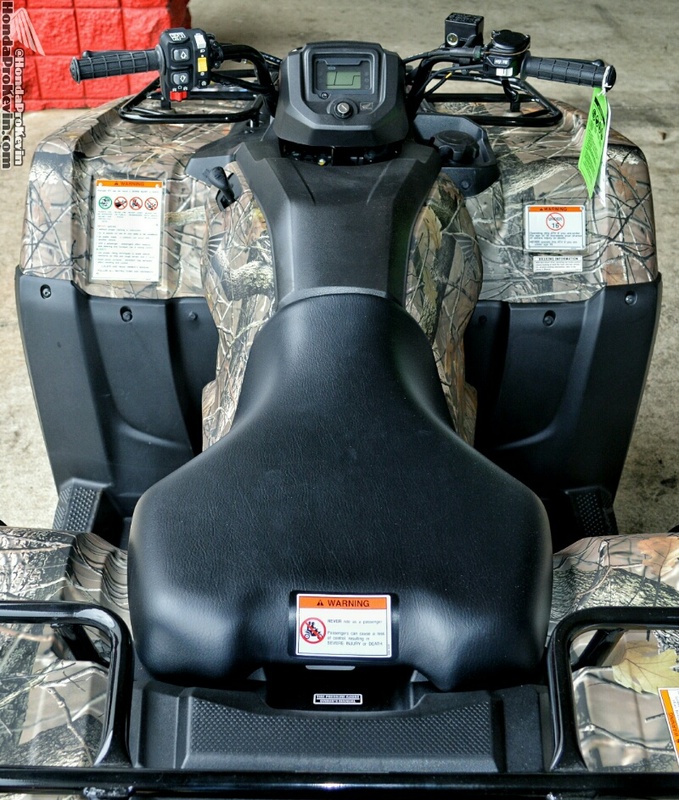 Did you find this 2016 Rancher 420 ATV Review of Specs and Features helpful? Would you like to see more of the models covered? Please click “Like” and or Share below if you enjoyed checking out any of my content, pictures, videos, etc. Thanks guys. 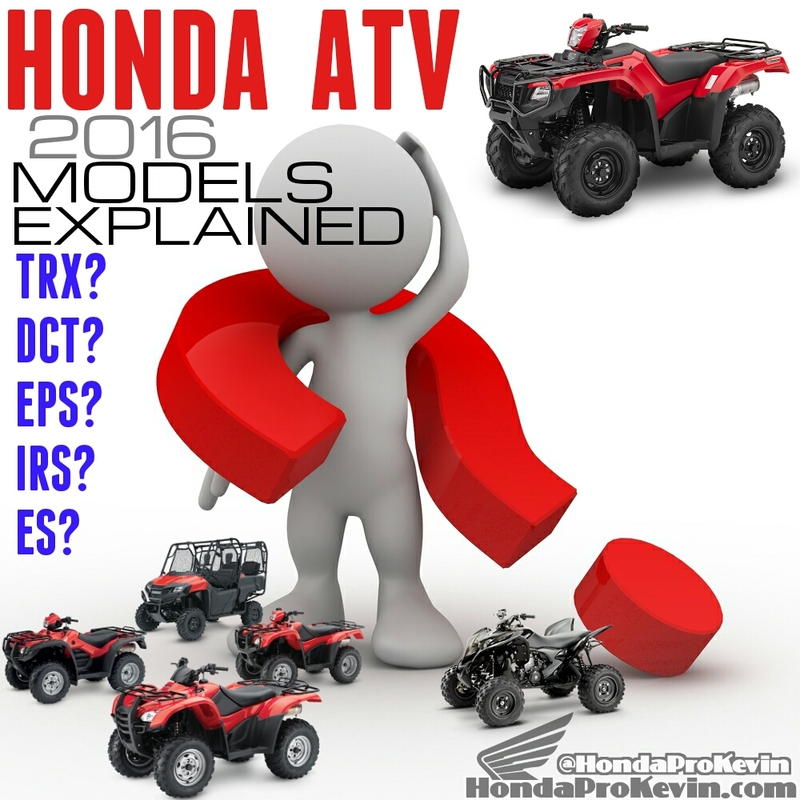 Confused by all of the 2016 ATV model names from Honda? TRX420FA1 / TRX420FM1 / TRX500FA6 / TRX680FA / TRX250TM / TRX420FE1 / TRX420FM2 and the list goes on. Learn what they all mean by Clicking Here. note No operator under age 16. Honda recommends that all ATV riders take a training course and read their owners manual thoroughly.